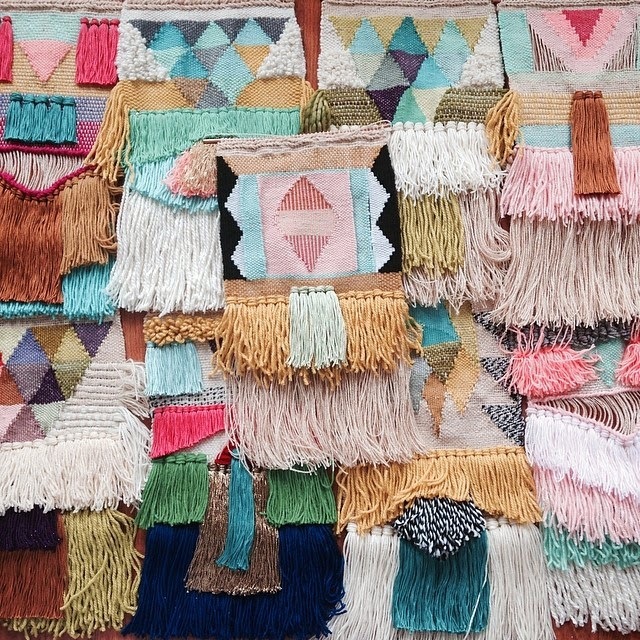 Lovelies in my Life : Weaving - My New Obsession! Weaving - My New Obsession! This is a long story and so I will tell all of it, in excruciating completely irrelevant to the point detail. It all started with an Etsy gift card, as all good shopping stories should. I have been in possession of this gift since the beginning of May and I have about a thousand (okay, 5 - 6) items on my Etsy wish list that are all so well ... completely perfect in every way. So I just can't make up my stinking mind and I'm sitting on this, waiting it out. 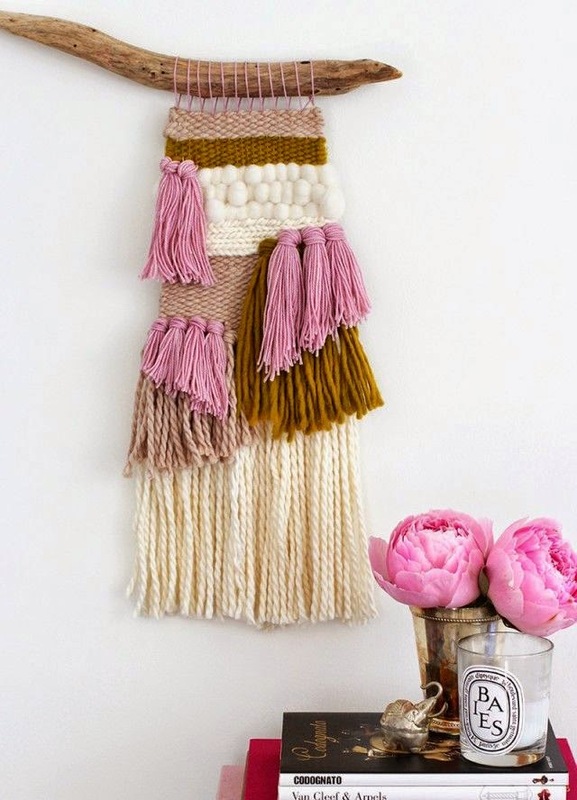 So these Etsy emails keep featuring these wall tapestries. And I'm digging them. And then I start to see them on Insta, one pretty pastel piece commissioned for a baby's room and a black and white version hung oh-so-cooly above a minimalist console table paired with a tiny potted plant. And before I know it, I'm completely engrossed. 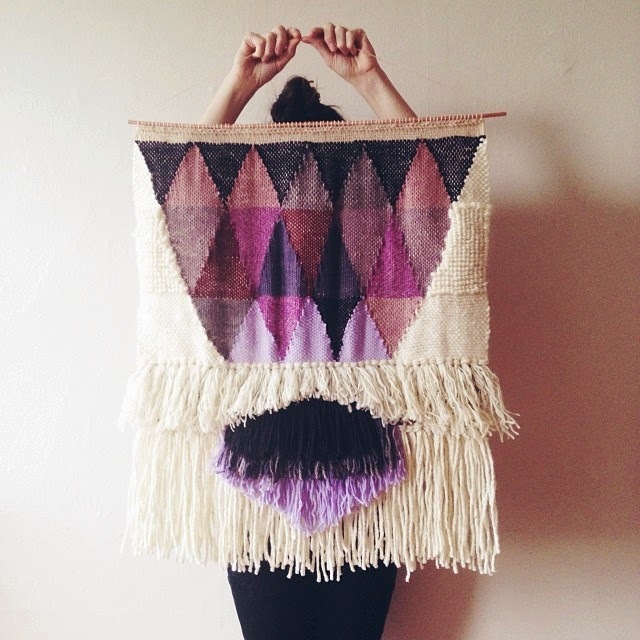 So weaving, this new-to-me textile art, really impresses me. It's a sort of nostalgic craft (hello 70's!) that now seems to have come back in a new way. And the artists that create them, those like Maryanne Moodie (top 2 images), are just plain incredible. Their creations are so beautiful but crazy, crazy expensive to purchase! I ended up selecting a few Etsy shops that were creating some amazing pieces but decided that really, I'm just not willing to spend that kind of money. But off I went to St Vinnys in the hopes of 1. finding a vintage version with a chic enough look and color combo to work in my home OR 2. finding a loom (did a little research on those too, prices/DIY options) and other supplies. And absolute shocker, I found a handmade loom, needle, yarn and twine. All there! Total of about $8 spent on all of it. And just in case I am an absolute failure at this, then no hard earned cash wasted right? So there's my loot. I hope to find a quiet morning when I can start working on my first project but realistically this may have to wait until school starts again in the fall. I will certainly keep you up to date on all weaving shenanigans. If it goes well, I'll try more color combos and designs. So how about you? Are you into the trend too or is this the first time you've noticed it? Would you give it a try? Woulnd't it be fun to meet up at a coffee shop and tackle it together? Or have a pro teach us how? Perhaps it could be the DIY for our next big workshop event. Would you go? And with that in mind, do you create these beauties already and if so, would you get in touch with me? I'd love to see your work. Let's collaborate! This looks so fun! Im up for another craft day how to! I would love to learn how to do something crafty like this....then I wouldn't feel so guilty staying up late watching Call the Midwife or something of the like.